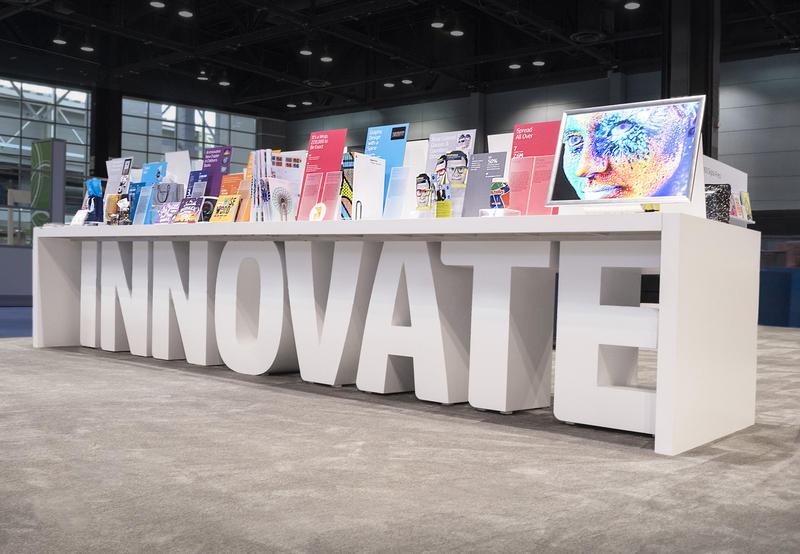 HP Inc.’s Graphic Solutions Business recently retained Grant Design Collaborative to create a travelling exhibit design showcase for debut at the PRINT 17 exposition in Chicago. Grant’s creative team was tasked with giving form to an exhibition concept to feature HP project case studies and print samples organized around three themes: Lead, Engage, and Innovate. From one-of-a-kind children’s books to posters flooded with fluorescent inks to two million unique Diet Coke packages, the exhibit featured dozens of stories and artifacts designed to capture the imagination of busy trade show attendees. It was conceived to be a welcoming space that encouraged visitors to linger and explore. Nestled in the corner of HP Inc.’s expansive exhibit, Grant developed and implemented the design experience for a 600-square-foot Application Boutique. The boutique featured custom designed and fabricated tables with a series of angular channels routed into the surface and running the length of each table. The tables functioned as open-source surfaces to curate a unique exhibit with display boards inserted into the channels. The modular system allows the showcase to expand and contract, as needed, for future events. Grant Design Collaborative’s assignment included choreography and curation of the project ensembles; space design and staging for all case studies within the confines of three tabletop surfaces; and copy, messaging and design development for each sample board with anecdotes, background information and imagery. Editing was crucial to establishing visual cohesion and accessible pacing and rhythm – while enhancing HP’s brand standards – across all three display surfaces. 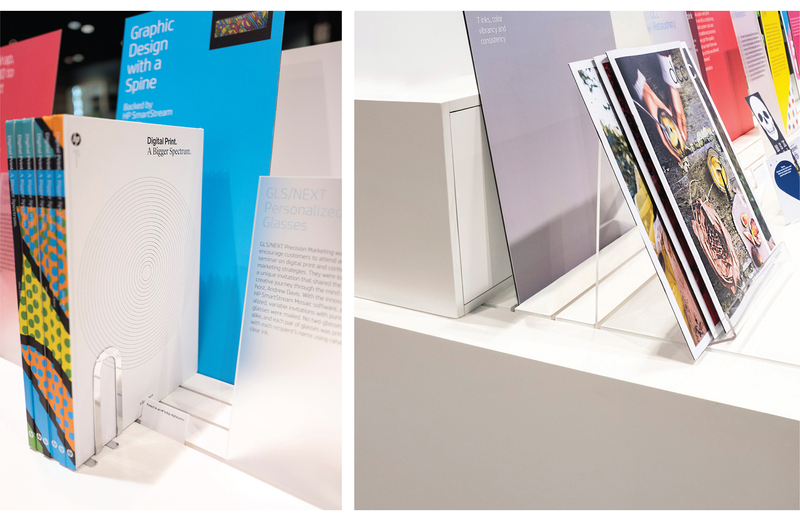 Each case study included Grant’s curation of application samples, colorful sets of HP Indigo prints mounted to Dibond boards, and printed frosted plexi panels with translucent display pedestals to create compelling HP stories. Functionality and ease of on-site set-up were also key design considerations. Each display included a system of easy-to-assemble components that could be easily dismantled, packaged, shipped and installed in a new venue. Following a very successful debut at PRINT 17, the inaugural exhibit was transported to Las Vegas for Pack Expo where select case studies from the original display were paired with new HP packaging case studies designed by Grant for a completely refreshed exhibit. In addition to experience design, Grant’s team also implemented a detailed mapping system with manifests and display diagrams to allow HP team members to easily identify, unpack and install the exhibit on site.